3A Introduction Not Your Mothers CPD! The Real World as we know it! Service vs education - who wins in postgraduate training? 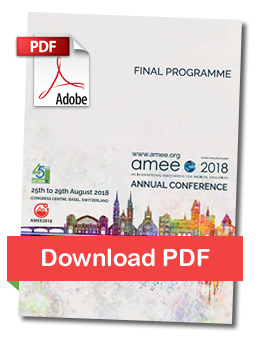 We’re pleased to welcome you to AMEE LIVE from Basel. .
Our truly international gathering of medical and health professions educators, researchers, administrators and students provides a wealth of experience from many different settings and cultures, and enhances the conference for everyone. Whether in the formal conference sessions or networking online, there are so many opportunities for us all to share our experiences - what has worked, or what has not worked so well for us - and to learn from the experiences of others. We welcome your contributions online. Each year we are told that it's the networking that goes on at AMEE conferences that is as important as the formal conference sessions. New collaborations are set up each year, and it's exciting to see the fruits of these collaborations in submissions to subsequent AMEE conferences. Contribute, listen, share, discuss, challenge, question – but most of all enjoy, and take home not lots of new ideas to try out back at home. We hope you will tweet about sessions you attend and share your views with others - please use #AMEE2018 in your tweets. We officially 'Go Live' with the opening plenary on Sunday 26th August at 1730 hrs (CEST) with subsequent plenary sessions on Monday, Tuesday and Wednesday. On behalf of AMEE enjoy AMEE Live! * Please note all times listed are CEST Central European Summer Time. 1850-1910 A musical welcome to Basel! Symposium: Assessing Social and Behavioural Sciences (SBS) in medical education: Square peg in a round hole? 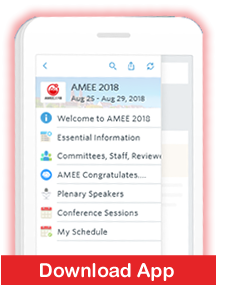 Tweets about #AMEE2018 OR "AMEE Conference" OR "#AMEE"
Download the completely free Guidebook app to your mobile device. Visit guidebook.com/getit from your phone and search for AMEE2018. The Guidebook app is available for Android and IOS. Visit guidebook.com/getit for more information. All presentations in the main auditorium are being recorded and will be made available here. Stay tuned. We will also email you when ready. Flash requires RTMP traffic and Port 1935 to be open on your firewall. If you can't see the video, it may be blocked on your local network/firewall - please run the following test to check if port 1935 is open and contact your IT administrator for further help.